Margot Robbie wore this Chinese-inspired Gucci gown to a Tarzan premiere in 2016, and the First Lady brought it back for a State Dinner in Beijing earlier this month. 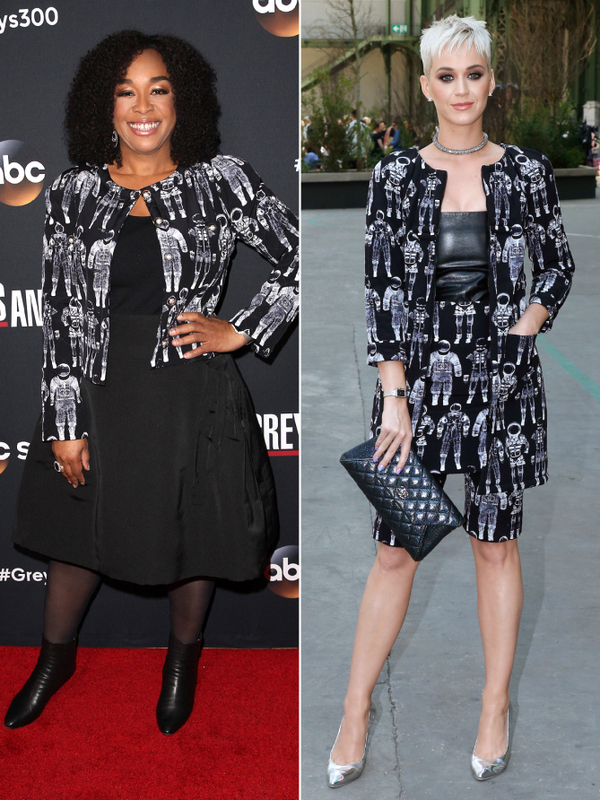 This Chanel jacket is clearly out of this world, and so are the stars wearing it. Florals on fire! The stars have us looking ahead to spring in their colorful Balenciaga top. Camo and crop tops go together like peanut butter and jelly. This gown features star-embroidery and a lot of sparkle . No wonder Cuoco and Knight are smiling so big. No you're not in the Upside Down. Both Mindy and Millie are really wearing the same bell sleeve dress. 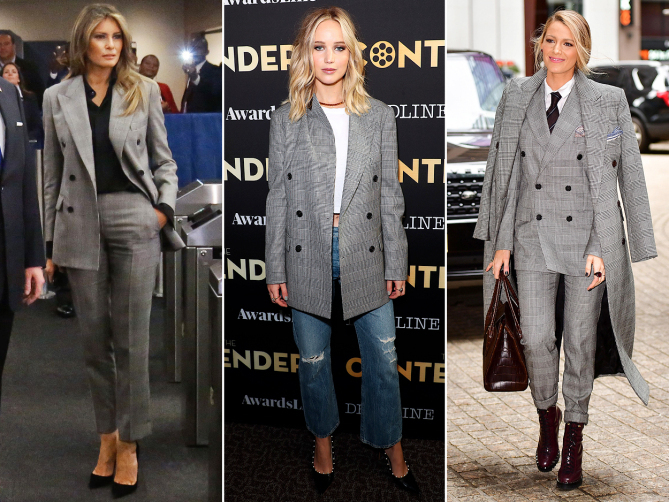 This plaid Ralph Lauren blazer just hit the runway in September, but it's already on everyone from the First Lady to Hollywood's top actresses. 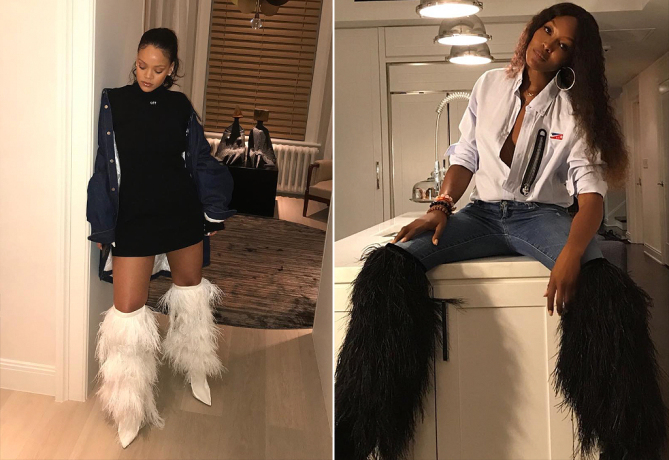 The YSL boots are definitely made fur posing, as Ri and Naomi expertly demonstrate. The stars are clearly pro-feline in their cat-print Dolce & Gabbana dress. The stars skip the basic LBD for a more party-ready, silver Alexander McQueen mini that's giving us some serious holiday party vibes . Same shorts suit, two very different ways to wear it. Both the superstar and the supermodel work this low-cut Nina Ricci maxi dress. A rainbow sequin robe dress is not for the faint of fashion heart, which is why these two risk-takers are the perfect stars to wear this Attico dress. This floral-print Proenza Schouler dress is sold out everywhere, which makes sense considering how good these stars make it look. The stars prove the high-low hemline is making a comeback in the same festive Zimmermann dress. These plaid, over-the-knee Off-White boots are made for singin' on stage and struttin' down the street. Dobrev accessorizes with a belt and studded pumps, while Haddock takes a more minimal approach to the same Prabal Gurung dress. This fairytale-level Erdem dress is what red carpet dreams are made of. Valentino gowns look so romantic and beautiful on the red carpet, it's no surprise the label is a celebrity go-to for big events. We want to wear this star-loved champagne Givenchy midi.